Ameringer | McEnery | Yohe in New York is hosting an exhibition of the works of artist Emily Mason, on view through 11 February 2017. The exhibition presents a series of recent paintings by American painter Emily Mason (b. 1932). Known for works that celebrate the expressive possibilities of color, each painting by Emily Mason are impregnated with individual mood and captures specific emotional and chromatic temperature, invigorated with her nuanced touch. 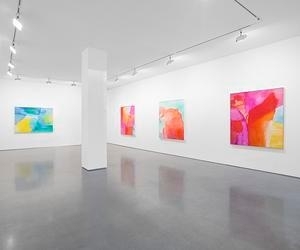 Sheets of vibrant hues with varying density fill across her canvases, as flat expanses merge with delicate clusters of pigment, creating deceptively complex compositions. Over six decades, the artist has explored through her distinctive style of lyrical, luminous abstraction, which reflects through her paintings executed in oil, carrying a sense of intriguing intimacy combined with uncompromising yet gentle intensity.